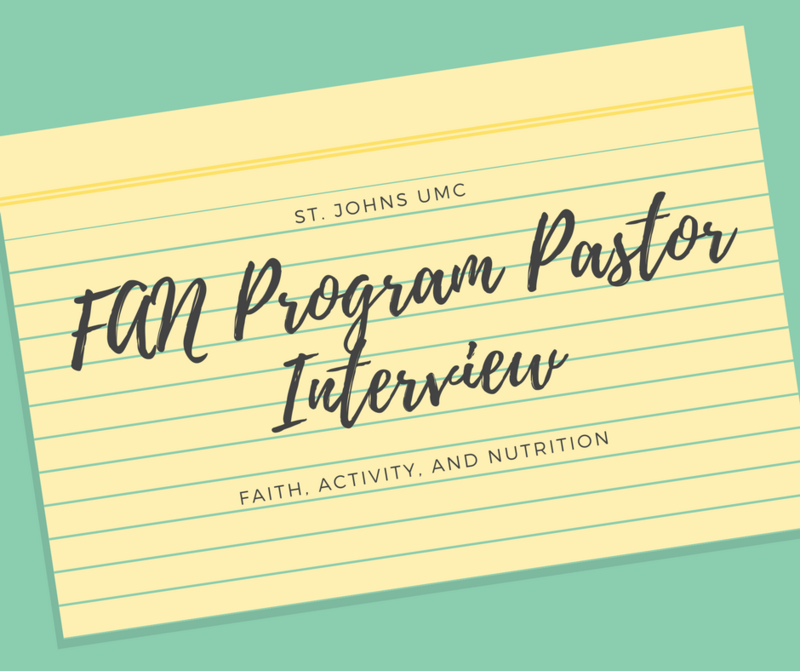 It is hard to believe that St. John’s UMC has been a part of the FAN program for almost 9 months now! I am so thrilled with the enthusiasm and participation of our church. Not only are the members embracing healthier options, but the pastors are also focusing on finding ways to improve their health. 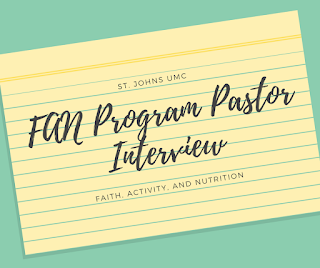 Pastor Rett graciously agreed to participate in a short FAN program interview. Below are the interview questions and answers. Why do you think healthy eating is important? Healthy eating is important because it honors the ways God created us and the world as good. When we practice healthy eating we acknowledge God's intention for us to feel and be healthy and happy. Are there any Bible verses that encourage you to live a healthy lifestyle? Which ones? The Daniel story. 'I came that you might have life and have it abundantly.' Paul's discussion of faith as being like training and competing as an athlete. Healthy lifestyles include activity, healthy eating, stress management, and adequate sleep and down time. What are some healthy habits you have adopted over the years? I work out for an hour a day, generally 30 minutes of cardio and 30 minutes of strength training. I try to manage my calorie intake as well as I regulate my macro nutrient proportions. I try to take time to be outside walking, biking, swimming or working in the yard. I aim to get at least 7 hours of sleep (as long as my children cooperate). I try to take Friday's off of work as often as I can. What, if any, other habits you would like to work on? I need to work on taking extended times off of work (multiple days in a row), for the purpose of refreshing and refocusing. Thank you Pastor Rett for taking the time to encourage us to continue to strive and grow. I love that Pastor Rett included the need for time off and rest. This is such a critical part to health that we often forget. I also enjoyed reading the Bible verses that encourage Pastor Rett. What healthy habits have you adopted? What other habits would you like to work on? Feel free to email me, Lacy Ngo, your answers!